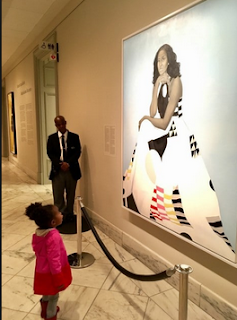 Last week, two-year-old Parker Curry became a media sensation because she was caught staring, transfixed, at the portrait of Michelle Obama at The National Gallery. The little girl became so popular that word reached the former First Lady, who invited Parker to her office for a dance party. I was her once. I was Parker. I was a little older -- perhaps 4. I know it was before Kindergarten and before I could really read yet. I could make out words here and there but I still needed help. My grandparents always kept glossy magazines on the lower shelf of their TV cabinet. While the rest of the family was blabbing the kitchen, which was the real heart of my grandparents' home, I sneaked into the living room to peruse the magazines. It was a thin, bound oversized softcover volume that I guess was about the Presidents and First Ladies of the 20th century. Lying on my tummy, flipping through page after page of black and white photos, I was distinctly bored. And who could blame me? Florence Harding. Grace Coolidge. Lou Hoover. Eleanor Roosevelt. Bess Truman. Mamie Eisenhower. Even if the photos had been in color, these women would have looked black and white. * Then I got to the end and I saw her. Jackie. If it wasn't this very photo, it was one similar. She wasn't portrait posed, like the others. She wasn't wearing "grandma" clothes and jewelry, like the others. She didn't look like she would smell of mothballs, like I was sure the others would. Whereas little Parker said Michelle Obama looked like a queen, I thought Jacqueline Kennedy looked like a doll. A Barbie doll that I would send on glamorous adventures. I quickly moved on, of course. Pre-schoolers have notoriously short attention spans. Besides, at that stage I was seriously into my collection of model horses. But that moment on my grandparents' living room carpet had an indelible impact. In a few short years, when her husband was murdered on my birthday, thereby disrupting my 6-year-old life and completely ruining my party, I felt that God gave JFK to me. Obviously I was supposed to learn all I could about him. And while reading about him, I naturally learned about her. She never broke down when her husband died in her arms, so she was tough. But also beautiful. She spoke French, Spanish and Italian, so she was smart. But also feminine. She cared about Important Things, like art and ballet, but she dressed just as well, if not better, than my Barbie doll. So she could still be cool and fun. First Ladies matter. I realize that there's a racial component to Parker's adoration of Michelle Obama, and I appreciate it. But that doesn't diminish Jackie as my early role model. I predict Michelle Obama's impact will be felt for decades to come, just as Jackie came to represent the ideal American woman to many of us Baby Boomers. *As an adult, I realize how unfair this assessment was. Especially about the esteemed Eleanor. But I was not much older than Parker, so you have to cut me slack.